Jumping in on Friday~for Thankful Thursday! Hope I’m not too late for the party! You know….the one we have each week giving thanks with a “grateful” heart to our Lord! I am thankful that we have returned home from a glorious week of vacation! Jeff and I were joined by mother and Grandbuddy for a couple of days basking in the awesome colors of fall in the mountains of North Georgia! We had a great time….but I am glad to be home again! 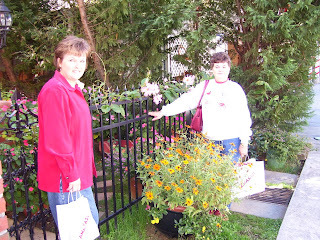 Mother and I were shopping as hard as we could in all the unique antique stores and specialty shops! I found a wonderful Christmas store!!! But, I am so thankful to be home—ready to see grandsons tomorrow! 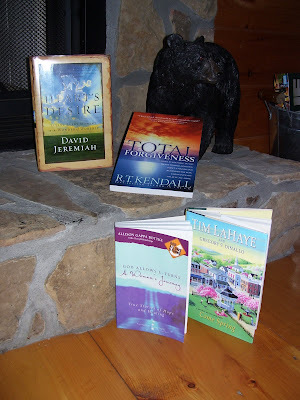 We had a blast—oh yeah….I was blessed to find these great books!!!! I will share more details of the trip later this next week. This morning my post with Laced With Grace opened–thankful for the “post dating” of that! (to see it click on the Laced with Grace button on the sidebar). to join in other thankful Thursday’s—I hope I not too late! This entry was posted on Friday, November 2nd, 2007 at 9:58 pm	and posted in Missions. You can follow any responses to this entry through the RSS 2.0 feed. Glad you are back and had a great time away! So glad that you had a nice time sweetie, welcome home.